Remember – The model AL-65/53 has only a 58 ft platform height and a working height of 63 ft. If you own a model AL-65/53 built between years 2002 -2006 you have a very important decision to make. 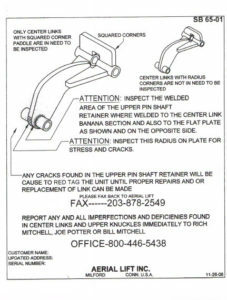 There have been numerous link failures and your choice are: (1) Up-Grade to the new style link with a cost of approximate of $35,000.00 or (2) it to be cut down to a model AL-60/50 for an approximate cost of $5000.00. 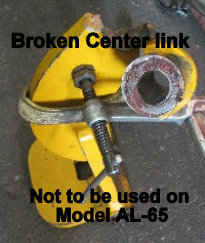 There were also some incorrect cables used on model AL-65/53, years 2007-2011. If you have problems keeping the drive cables tights, it may have the wrong cables installed and should be done Immediately. Make sure the Top cable nuts are not backing off. Location shown in photo. Its recommended that all cables leveling and drive cables be changed every 8 years. 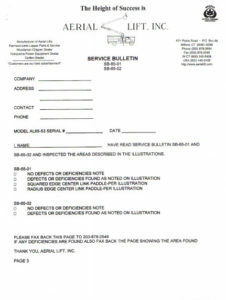 In 1992 Aerial Lift had their first cylinder rod failure, this was 1 of only a few ever to date. There was an issue with section machined down for the piston and the shoulder of the Rod where the radius was not to specifications and the piston would start to loosen up. The original drawing dimensions were to be .003 to .005 degrees. 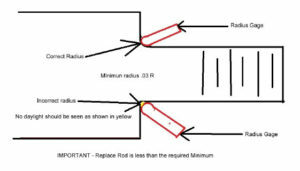 Show in a bottom incorrect radius, it indicates that the radius is more like a 90 degree sharp edge where it has the potential to crack and break. The top shows a nice rounded radius. Your cylinder rod block along side the grease fittings on both the upper and lower cylinders should have some type of stamping. In the early days there was a PR and a possible date stamped into it, PR stood for proper radius. Its a standard to have the cylinder rods changed every so many years depending on the model year. it could be 6, 8 or even 10 years, check your manual. It was written that all units manufactured prior to Mid 2006 be changed every 6 years and all units there after to be changed every 8 years. Check for Loose Piston, Hold your hand firmly against where the rod and cylinder wiper seal meet. Run the unit in a rocking motion letting the handle go and feel for a Tapping for banging motion. A slight smooth motion is normal. 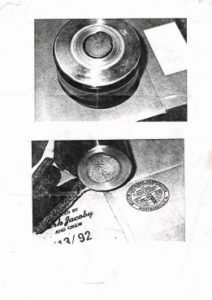 The difference between the old style and New style is the cutout section as shown on the top side of the below piston photo. 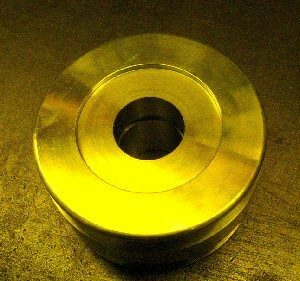 This 1-1/2″ id by about 3″ OD machined section recessed area is for a hardened Washer with the shoulder radius. 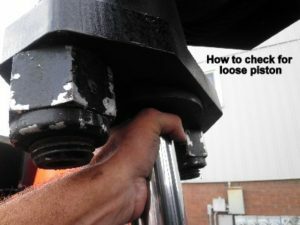 Because of the New Torque specifications of the Piston nut from the original 400 ft lbs now being 1640 ft lbs, the Washer is needed to prevent the shoulder of the Rod up against the Aluminum piston to crush or indent Piston. 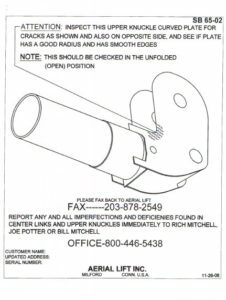 Do Not torque Old style to New Torque specs. I am the only person in the country who is concerned about your safety on this issues and put it up front. There are some Aerial Lift employees who are still within the Industry that are tight lipped about this. 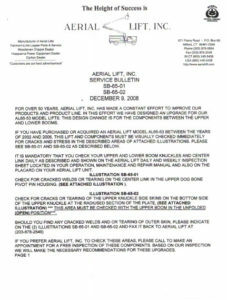 ALL of the Models AL-65 built between 2002 – 2006 that have not had the Up-grade or Cut down should have been recalled.